Hi Folks! My favorite part of the Creativation trade show in January is always meeting people in our community. This year at the Ellen Hutson dinner I was thrilled to see for the first time my long-time blogging friend Katie Brooks and give her a huge hug. 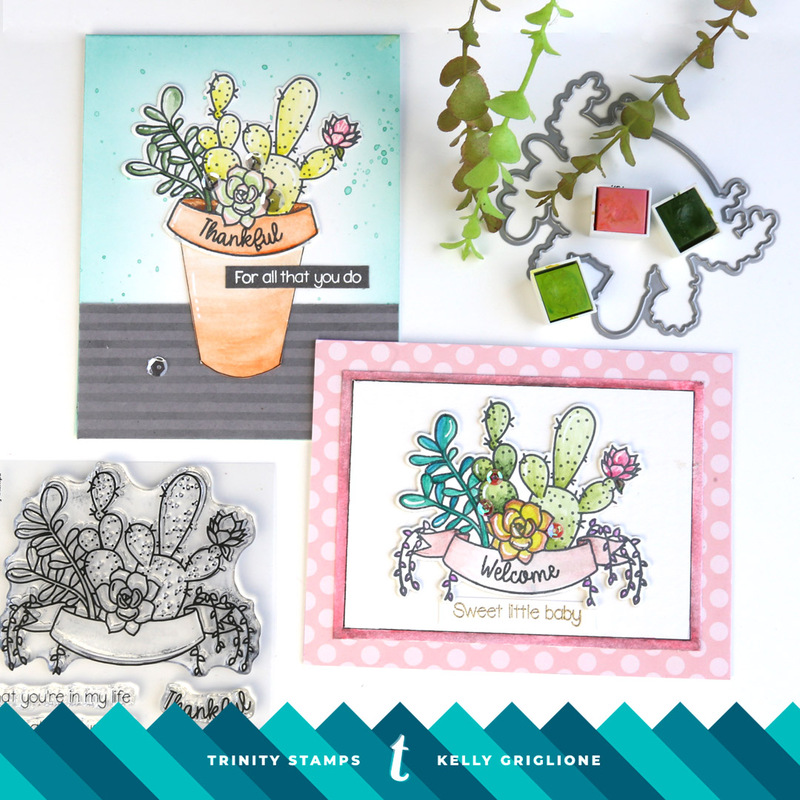 I also had the good pleasure of meeting Taniesa, the owner of Trinity Stamps. Her story of starting a new company with the same work ethics as her grandparents, who were also very successful business owners, is very touching and inspiring. 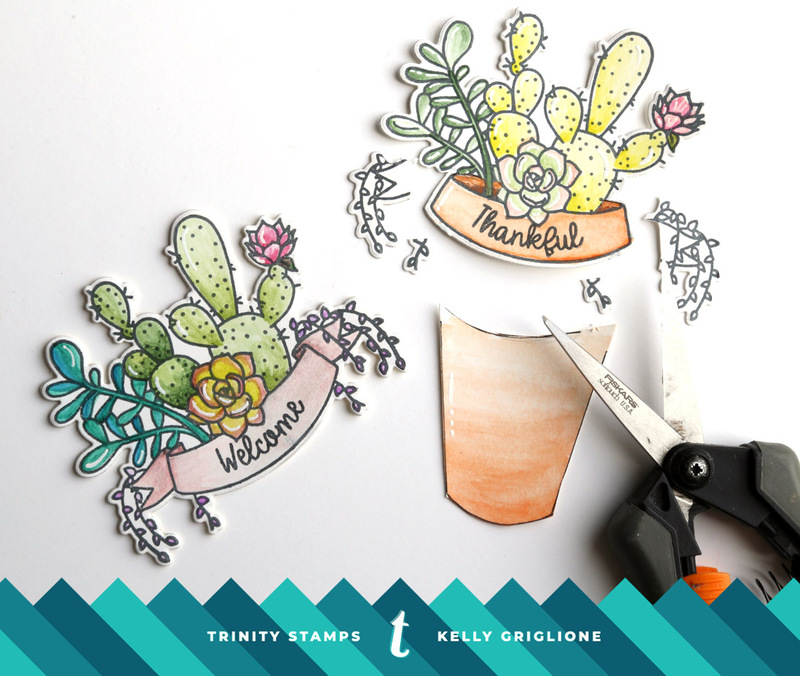 While we were chatting, Taniesa asked if I would like to be a guest designer for Trinity Stamps, and I totally jumped at the chance. I'll be appearing on their blog twice this month ... the first post being today! 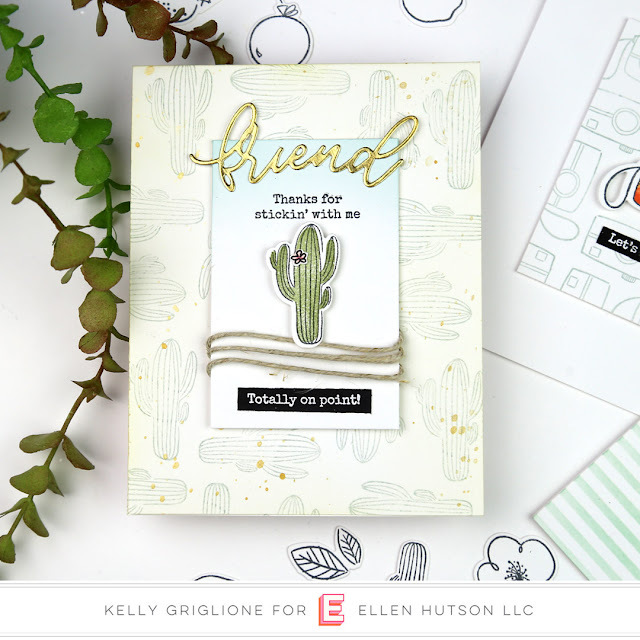 I'm sharing two different cards with the same gorgeous succulent image, and showing how I modified it for the second card. I'd love it if you'd come by and visit! Oh boy, I've been waiting to share the HUGE Die release from Pinkfresh Studio with you! It's called the "essentials" and it's just that ... dies that you'll turn to again and again for your paper crafting. 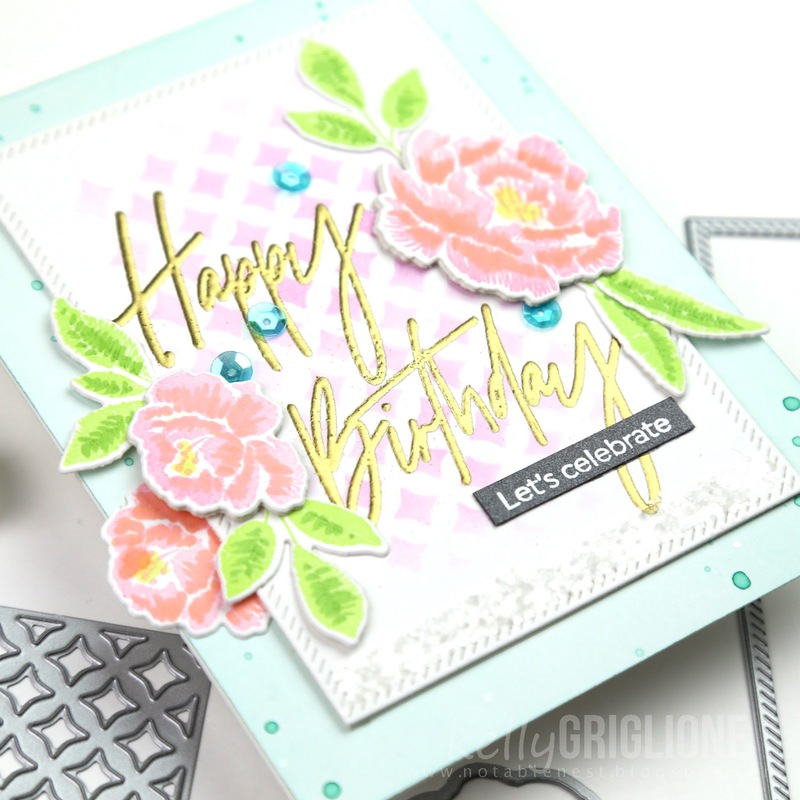 You'll notice they're all the basics (rectangles for card panels, circles, ovals, tags, borders, words) but they all have a little something special making them not-so basic. Like the diagonal stitching on the rectangles, the cutouts for the tags, etc. 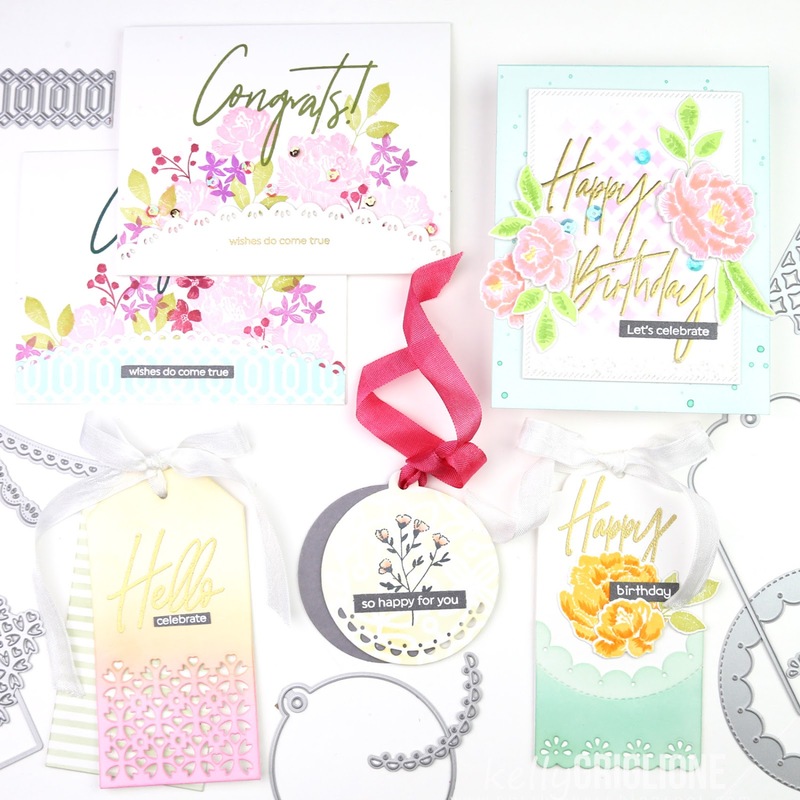 You may have come from the blog of Ivana Camdzic but if not please feel free to start at the beginning of this Blog Hop with our wonderful host Pinkfresh Studio. 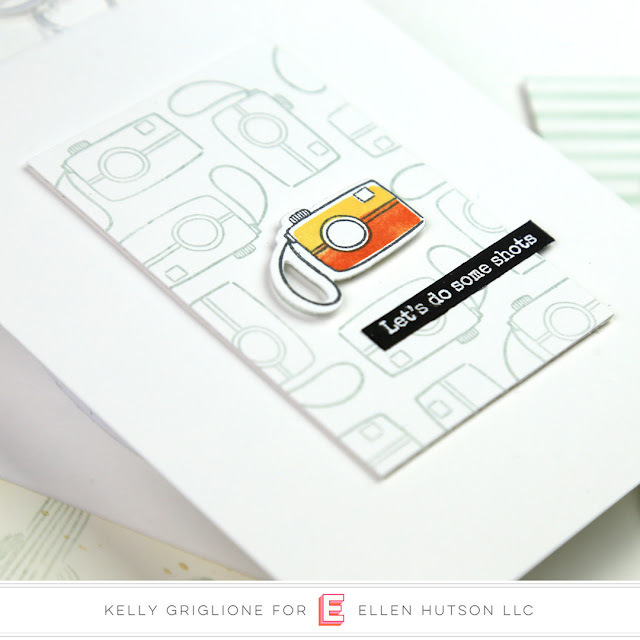 The first set of cards features the Classic Edgers with 5 different options to add a fancy edge to all sorts of things ... card borders, the bottom of the card itself, the end of a tag, you name it. 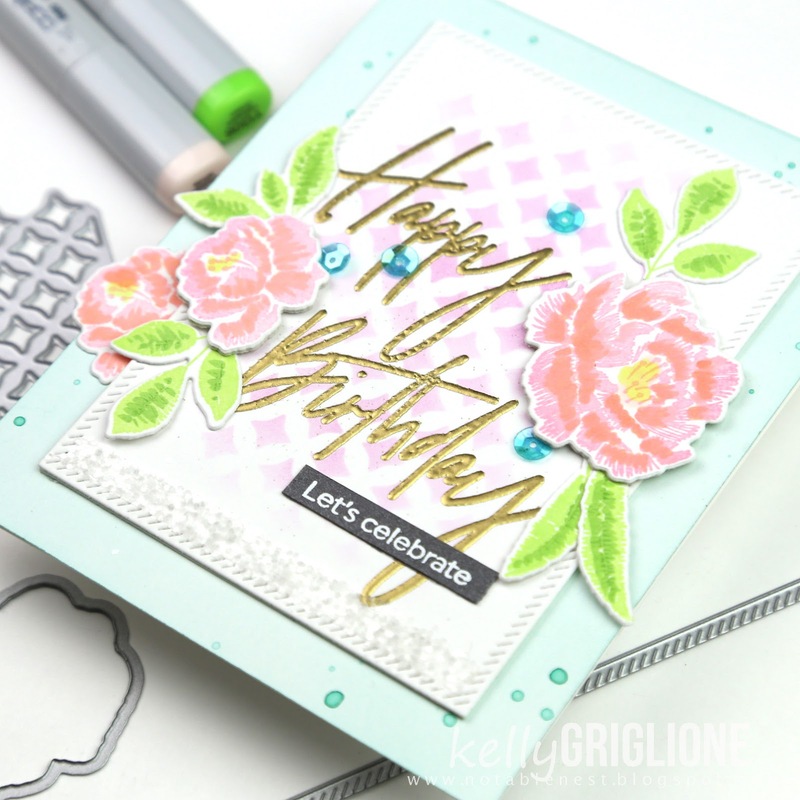 Here I've used it to "hold" the bouquet of flowers from the Embroidered Blossoms stamp set. Here's a closer look at the pretty details of the edger die, including the cutouts and the dotted edge of the scallop. 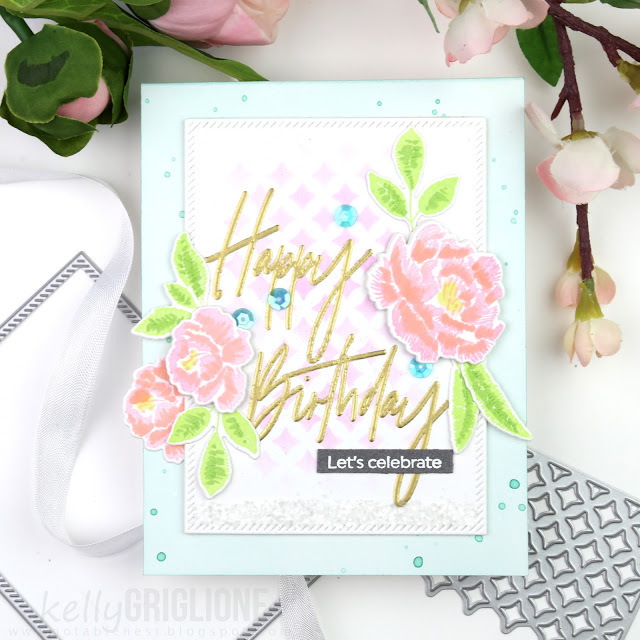 The coordinating card features a loopy scallop edge with a blue pattern on it ... this actually comes from one of the dies in the Classic Tags with Fillable Elements set. Instead of using this die to cut a pattern at the bottom of a tag, I used it to create a stencil by cutting the pattern from adhesive vinyl (but this also works well if you cut it from regular copy paper). Then I just sponged ink through my handmade blue stencil along the length of the border. This is a GREAT way to get extra mileage from your dies. 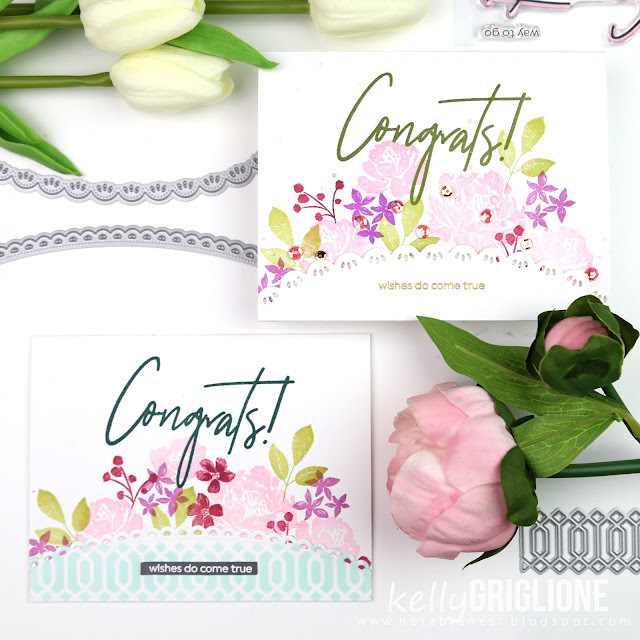 You could use this formula with any set of floral stamps ... just stamp a bunch of them on the bottom section of your card and layer a border on top. It's also a great place to put a secondary sentiment if you need it! Speaking of tags with fillable borders, here's one of those! 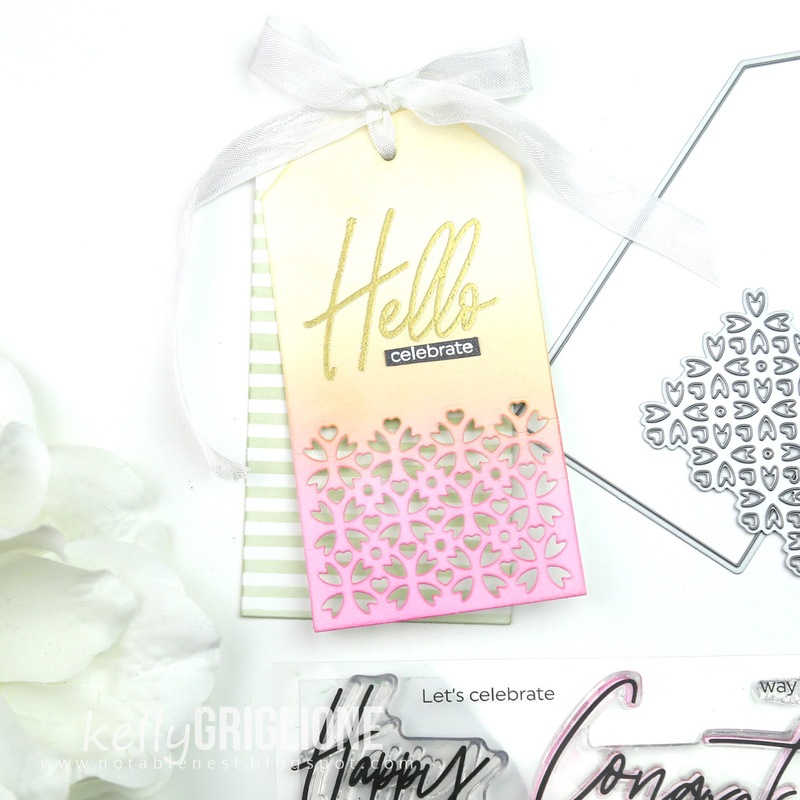 I cut two of the classic tag shapes from Classic Tags with Fillable Elements and cut out the cute little floral heart motif from the top tag. Love all the texture it gives your project, as well as how it lets the bottom layer show through. Then I just stamped a sentiment from Scripted Bold Sentiments 2 to finish the tag. Done! Also from the Classic Tags with Fillable Element die set there are circle tags, with optional circular cutout elements. Again, I cut two of the circle tags plus a border out from the top tag. 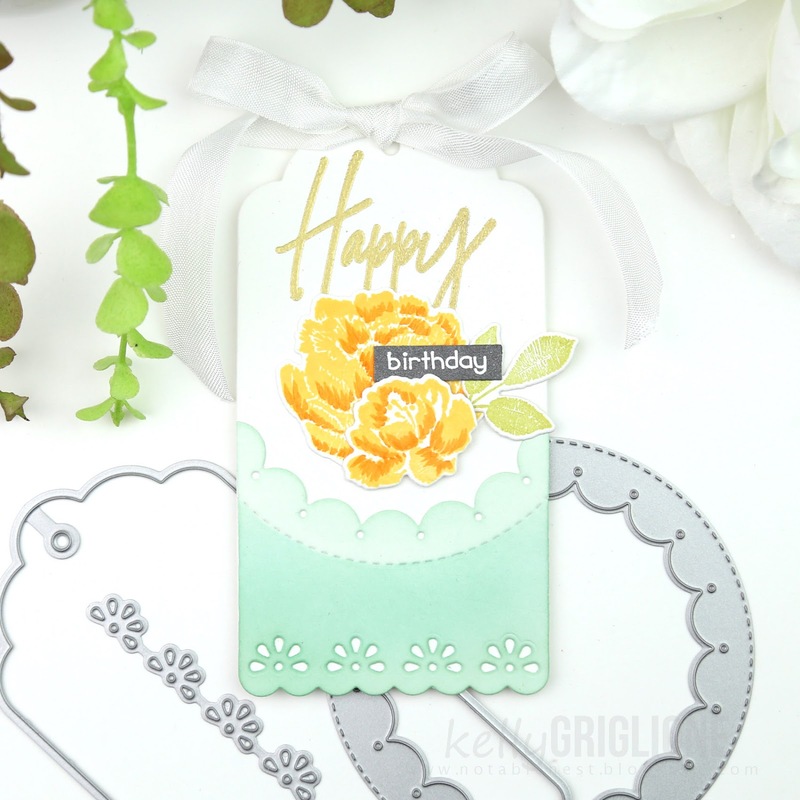 Yellow ink is softly stenciled through the Fancy Floral 2 die. A flower from Embroidered Blossoms is stamped on top. The sentiment is again from Scripted Bold Sentiments 2. The third tag style included with the Classic Tags with Fillable Element die set is a scallop tag. Here I've layered an additional piece on the bottom where I've used the Inverted Stitched Scallop Circle to create a fun inner edge, and a lacey fillable element to create a fun outer edge. As with all of today's projects, the flowers and sentiments are from Embroidered Blossoms and Scripted Bold Sentiments 2. Such a variety of tags! Finally, I've got a card featuring the self-explanatory Diagonal Stitched Rectangles. Love these! 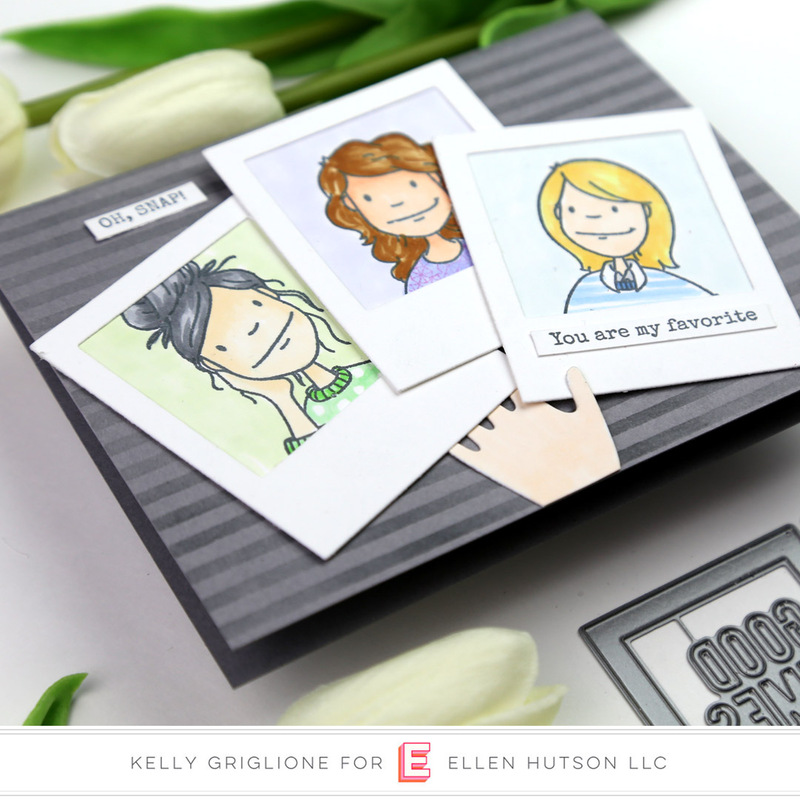 What a staple they will be for card makers! Those diagonal stitches add just the right amount of texture and shading to the edge of the rectangle to make it interesting but not distracting from the overall design. On the diagonally stitched rectangle, I've stenciled one of the patterns from Classic Tags with Fillable Elements again by making my own stencil from die cutting adhesive vinyl and sponging purple ink through it. Two for the price of one! 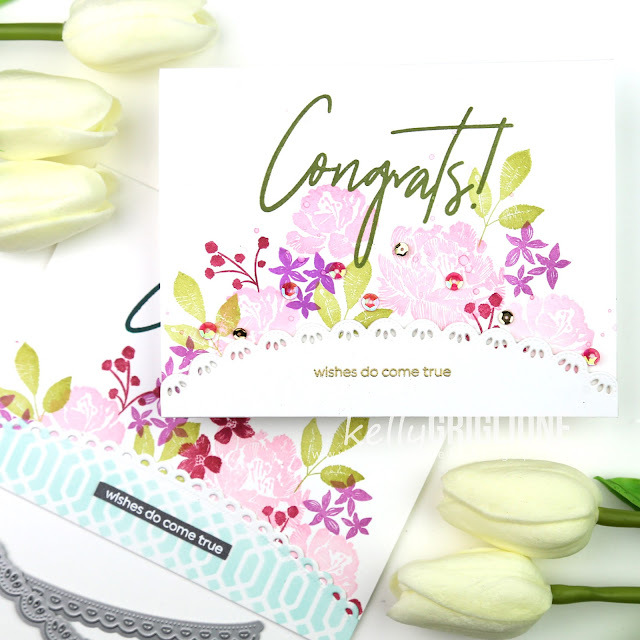 The beautiful florals are from Embroidered Blossoms and Embroidered Blossoms Dies, and the sentiment is again from the workhorse set Scripted Bold Sentiments 2. 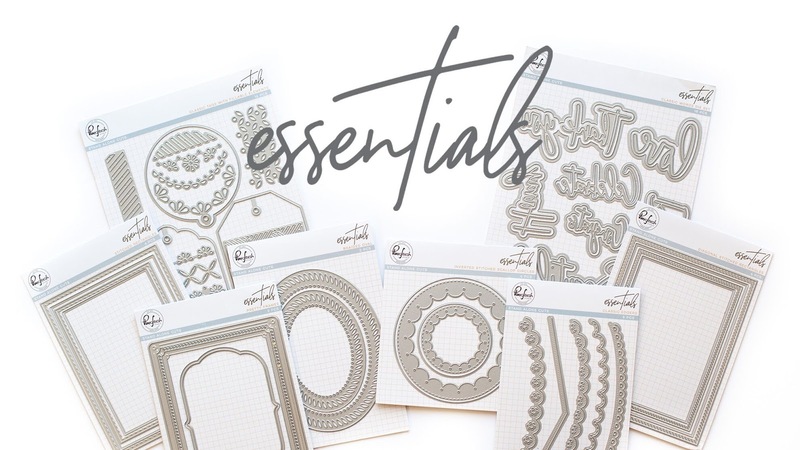 Such a variety of projects from these true essentials for any paper crafter! There are so many ways to win! The full April Essentials release will be given away on the Pinkfresh blog and on the IG feed. 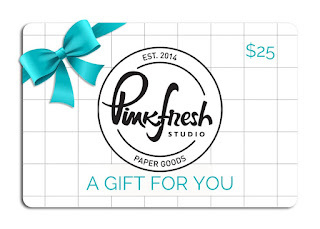 In addition, I am giving away a $25 gift card on this blog post! To be eligible, just make sure you're following this blog and leave a comment below. The winners will be posted on Sunday, April 14th on the Pinkfresh GIVEAWAY PAGE. Please check this page and claim your prize within 2 weeks. Best of luck! More good news! First is a free, adorable House die with purchase. There is no code necessary, and the die will automatically load into your cart. You can also take advantage of the free/discounted shipping from April 8-11th on orders $50+. You must use the code APRESSFREESHIP50. Shipping is free in the USA, and $5.50 off for International friends. 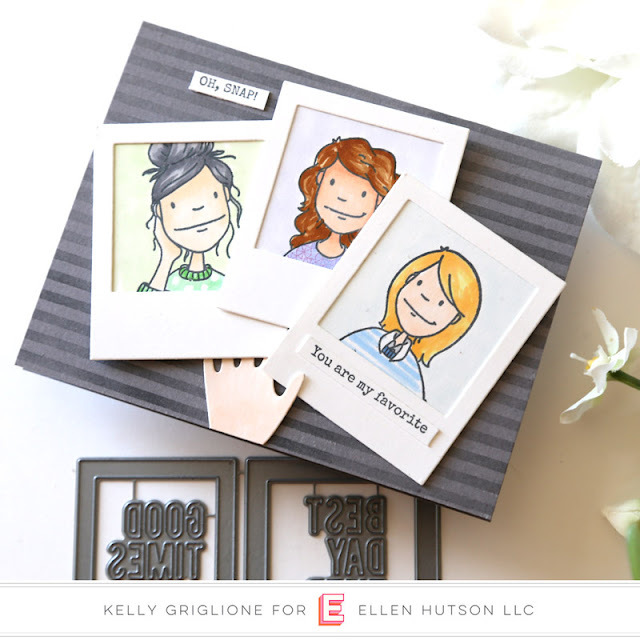 Your next stop is another Kelly ... Kelly Lunceford who has something fabulous to share with you! 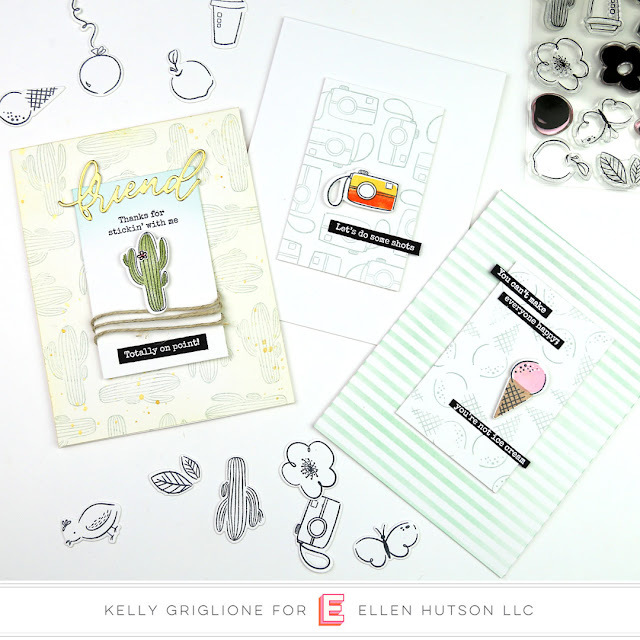 I've got two more new stamp and die sets to share with you from the latest Essentials By Ellen release! This first card showcases the new Instant Photo Frame die, which as you can see at the bottom of this photo, also comes with some fun sentiments in the middle if you choose to use them. My homemade stencil from the Skinny Stripes die is on the background again. This next set is Handful and has these great tall, skinny sentiments to go along with hands holding different things. I made these before going on vacation, and on the plane ride as I was getting my IG posts ready I slapped myself in the head after realizing what I did. My intent was to have this be an aerial scene looking down at someone relaxing at the table, about to drink their coffee. I didn't realize that the hand on the left DID NOT COME WITH A SWEATER! So it looks like someone who's I guess so in need of help that she's sitting at the table with one sleeve rolled up. Hahaha! The small panel is matted with a section from the Bed of Roses die which I just love using for backgrounds. Hope you enjoyed these two new sets! These, and the entire release, are available now at Ellen Hutson! 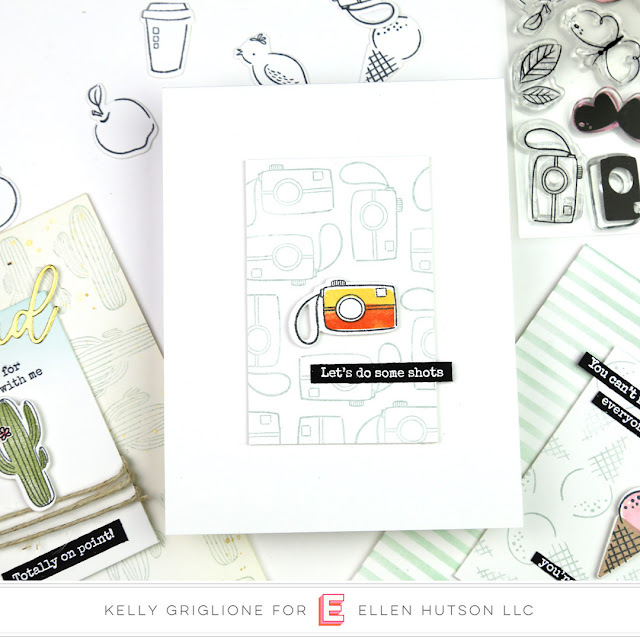 We've got another Essentials by Ellen release that's available now!! The two sets I'm using for these cards are Everyday Punnies and Everyday Doodles, and they're truly sets you could use every day. There are so many cute little illustrations, and the best thing, there is a hilarious pun or two to go along with each one of them! 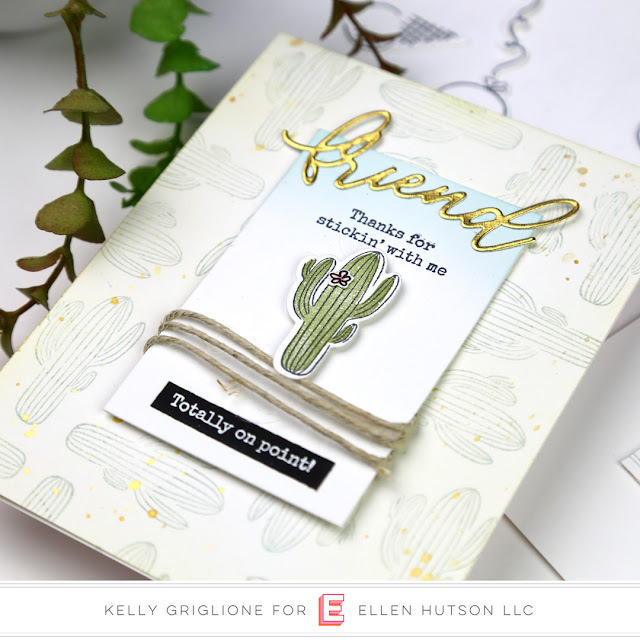 This one uses the cactus and two of the punny sentiments to create a totally custom card for a friend who has been by your side forever. This card, and actually the next two as well, are all created with one stamp and the same formula ... stamp one main image, and then stamp the image again all over the background. Makes things a lot easier when you're making multiples. The tiny flower I drew and cut out ... don't forget you can always add your own embellishments! This sentiment on this one just CRACKS ME UP! And it's so darn true. Who doesn't need to be reminded of this every now and then? I don't recall seeing this sentiment before. I'm telling you, this set is just full of gems. Again, just stamping the main image and then stamping it again (in a lighter color) all over the background of the panel. The base of the card is a stencil I made using several cuts of the Skinny Stripes Die. I'm not a drinker, but I love taking photos ... and I can't wait to send this to my cool friend who shares my love of photography. She will totally get a kick out of this one! It's super clean and simple, which is perfect for letting all the attention rest on the fun sentiment.